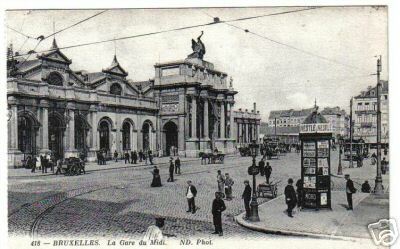 The original Gare du Midi before it was re-built. Ever wondered if you could follow the route the evaders took as they escaped from Nazi Europe in the Second World War? The following journey attempts to follow the route of the first Comet Line escapers as they made there way south. If you wish to do the whole of this journey yourself it would be best to arrange your arrival to coincide with the annual Comet Pays Basque Walk organised by the "Les Amis des Reseau Comete". Plan to arrive on the Thursday before the walk which is usually held the second weekend of September. You can buy a ticket to Quievrain on the day you do not need to book in advance. The trains now seem to go direct in the past you had to change at Mons. The journey time is 1hour 23 mins. Second Class single fare 12.10 Euros but look out for concessions. The trains run every hour on weekdays. Later in the war guides like "Nadine" would take the evaders by tram further north to Louvain station and board the trains going south there to avoid the stricter controls at Brussels-Midi. She would change trains at Mons and stop for refreshment at cafe in the city. Although the railway line seems to continue into France the trains all terminate here. In front of the station is the Place de la Gare, with your back to the station head to the right across the square to the Rue de la Gare. Walk to the end of this road and turn right into Rue Debast, you'll see a war memorial in front of you. Keep walking until you reach a four way crossroads and turn left into Rue Grande. Keep walking until you reach where the road turns right into the Rue Valenciennes and you see a direction sign to Valenciennes on your right. Continue walking past many shops and cafes, you will see see a large traffic island in the road and the old customs and passport control buildings on your left. At the end of the traffic island is a bridge across a small river, you'll see from the signs and a marker stone that you have crossed the Belgium- France border. At that time it seems that passengers reboarded the train after the customs check and it continued to Valenciennes but I believe that the evaders left the train at the station and walked into France to catch the tram to Valenciennes as it was a safer, less controlled, route. The tram was replaced by a bus service in the 1960's and through trains to France ceased in 1984. Continue along the road which becomes the Avenue Jean Jaures until on the left-hand side of the road you come to a bus shelter under a tree. It would have been at this border crossing in October 1941 that Comet evader and Cameron Highlander Allan Cowan, travelling with fellow Scot Bobby Conville and guided by Tante Go, was stopped by a French customs officer and found to have a large quantity of contraband cigarettes, luckily the officer seemed to understand who he was and after taking a share of the the booty, let him go. Wait for the Number 15 bus to Valenciennes here at the "Frontiere" bus stop. It is a 34 minute journey to Gare Valenciennes (Valenciennes Railway Station) which is the last stop on the route. The fare at the moment is 1.60 Euros. Buses are approximately every 20 minutes. The walk from Quievrain Station to the Frontiere Bus Stop is 1.4km say about 18 minutes. If you started your journey from Brussels at 9 or 10 on the morning you may be thinking of lunch around here. Travelling on this bus with a colleague in 2008 we omitted to cancel our bus tickets in the machine on the bus. The ticket inspectors got on and we had a slight feeling of how the evaders felt as we played our "stupid foreigner" act to the uniformed officials. They let us off without a fine. From here you can get the train to Corbie. Again there is no need to book in advance. best to get the trains with a change at DOUAI rather than Lille as they take only about 1hr35mins. Standard second class single fare is about 20 euros. You have a choice to make before you set off on the journey. Stay in Valenciennes the night or continue to Corbie and stay there, Valenciennes is a city about seven times larger than Corbie so therefore has a much greater choice of hotels. If you decide to stay in Valencienes a walk to the city's War Memorial on the Boulevard Carpeaux and pay your respects to Comet's Charlie Morelle whose hometown this was and whose name is on the memorial. Arrested in May 1942 he died in Dachau concentration at the time of its liberation by allied forces. From Valenciennes station the War Memorial is a 1.6km walk say about 20 minutes right through the centre of the city. Andree De Jongh describes taking her evaders into a cafe near the station, probably this place. If you are staying the night in Corbie the Hotel de l'Abbatiale in the Place Jean Catelas is recommended. It is about 750 metres from Corbie station say 9 mins. walk. From the station to the bridge over the Somme is a about a 15 minute walk shorter if you are coming from the hotel. Cross the bridge and turn left along the Somme which is a canal here, past a grain silo and the road becomes a path alongside the canal. Of course this is where the evaders would have had to swim or if lucky take a rowing boat across the water. Continue walking with lakes and trees to your right over a kind of bridge or lock where a small river enters the canal. The Somme bends to the left here and soon after you should see a path going off to the right. Go up this path and you start entering the village of Hamelet on the Rue Suzanne Potet. You then reach a T-junction on the Rue Francois Deroussen turn right and further up this road on the right hand side is the house of "Nenette" where the evaders and Andree De Jongh would spend the night. Turn around and retrace your steps along the Rue Francois Deroussen until you reach the village church on the right and a right hand turn into the Rue de l'Eglise, continue along this road until on your right you see the entrance to the village cemetery. 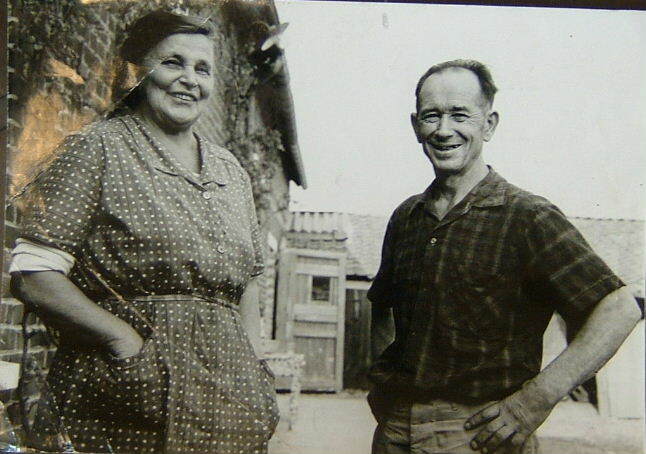 Enter the cemetery and on the lefthand farside you should find the grave of Renee "Nenette" Boulanger and her partner Spanish Civil War veteran Ignace Sobieszuk who along with Nenette's daughter Josette also assisted the evaders. 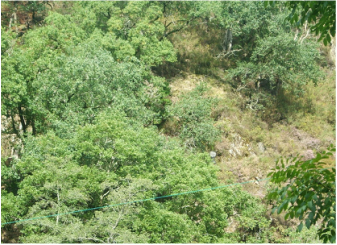 You now face the longest walk of the journey so far quite a bit of it uphill 6.1km about 1 hour 20mins. Turn right as you leave the cemetery and walk to the T-Junction with the Rue Combattants d'A.F.N. You are now at the southern edge of Hamelet. Turn left at the next junction and a short while later take the right-hand fork in the road. At the next fork take the left-hand road and continue until you reach the D122 road which you go straight across. As you continue walking glance to your right and a few fields away you will see the Australian War Memorial that many evaders mention passing in their Escape and Evasion reports. You will now be entering the town of Villers Bretonneux and the D23 main road, turn left along this road and walk just over a kilometre about 13 minutes to a righthand turn shortly followed by a lefthand turn which takes you to Villers-Bretonneux Station. If you find yourself crossing the railway on the main road you've gone too far but you will be able to see the station from the bridge if you look to your right. Trains to Paris are infrequent from the station except in the morning rush-hour and for historical accuracy it is best to go with a change at Amiens rather than Tergnier or Laon. You buy your tickets from a machine and they should be under 25 euros if you travel via Amiens. The journey takes just over two hours this way but the early morning trains are faster with weekday trains at 06.50, 07.21, 07.50, 08.21, 08.50 (another change at Compiegne) 13.21, 14.50, 17.21 and 20.21. Best to check the SNCF timetable on-line to confirm all this. ﻿This is the night train( Intercités de Nuit couchette train) from Paris Gare d'Austerlitz departs 21hr40 arrives St Jean de Luz 09hr03 the next day. Daytime trains leave hourly from Paris Gare Montparnasse some trains are direct and some you will have to change trains. In order to join the Comet route walk and take part in the commemorations you need to arrive on the Thursday before the start, the 10th September in 2015 and stay four nights. St Jean de Luz is a very pleasant holiday town with beach, casino, fishing port, many restaurants and bars, although the summer season is coming to a close the hotels can still be expensive, I usually stay at the Ibis hotel or the Ibis Budget hotel across the bridge in Ciboure which usually charge less than £50 per night.